Updated Friday October 26, 2018 by NYB. 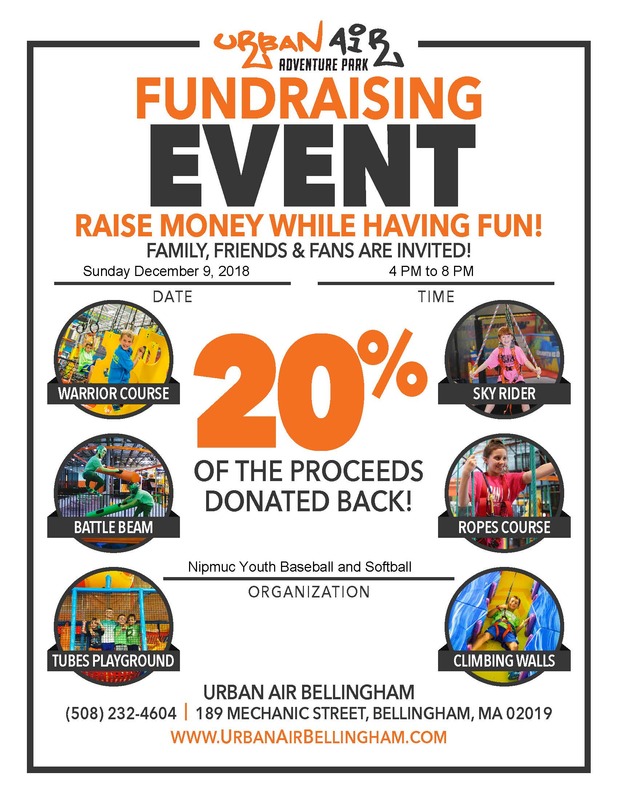 Nipmuc Youth Baseballand Nipmuc Youth Softball are holding a joint fundraiser at the Urban Air Adventure Park in Bellingham on Sunday, December 9th. Have fun between 4:00 PM and 8:00 PM, and 20% of all proceeds will be donated back to Nipmuc Youth Softball and Baseball! Activities include a Warrior Course, Sky Rider, Battle Beam, Ropes Course, Tubes Playground, and Climbing Wall. It will be a great way for kids to burn some energy as it gets colder outside, and it will be a great way to earn some money for our organizations! Urban Air is located at 189 Mechanic Street in Bellingham. Their website is www.urbanairbellingham.com.